Derek Sheils won the Open and feature Cookstown 100 races in 2016. The official launch of the KDM Hire Cookstown 100 will take on Thursday night, when details of a top quality line-up will be announced. Honda Racing’s Guy Martin will return to the Orritor course in Co Tyrone from April 28-29 and will undoubtedly be the star attraction on his Honda Fireblade SP2 Superstock machine. Martin was a double winner on his previous appearance at the event in 2015, when he clinched both the Open and feature Cookstown 100 wins for former team Tyco BMW. The Lincolnshire rider shocked the motorcycling world in January with the announcement that he had signed for the official Honda Racing team alongside John McGuinness to make his road racing return. Martin sat out the 2016 season on the back of a serious crash in the Dundrod 150 race at the Ulster Grand Prix in 2015. A strong line-up also includes Derek Sheils on the Cookstown/B.E. 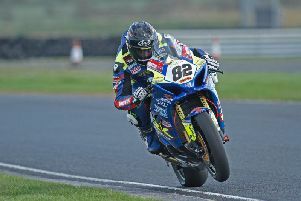 Racing machines, who notched a big bike double last season at the event on John Burrows’ Suzuki GSX-R1000. Sheils is joined by Mullingar’s Derek McGee, Michael Sweeney from Skerries and Magherafelt man Paul Jordan, who clinched pole for the Supersport race last year and won the man of the meeting award. A prominent newcomer is also set to be confirmed at the launch in the Royal Hotel, adding further quality to an impressive grid. Cookstown team McAdoo Racing will be out in force this year, with James Cowton riding a full stable of Kawasaki machines in the famous livery. Cowton was in the thick of the action at the meeting last year in the Supertwin race and will be bidding to give the McAdoo team a popular victory at their home race. The Cookstown Club revealed that all classes, with the exception of the Moto3 (125GP) category, were oversubscribed. Around 18 races will be run during a hectic schedule on Saturday, April 29.